This is a blog you’ll enjoy if you like writing! I write for magazines in the UK and abroad and I am also the Agony Aunt for Writers’ Forum magazine. So… have you finished your Christmas shopping? 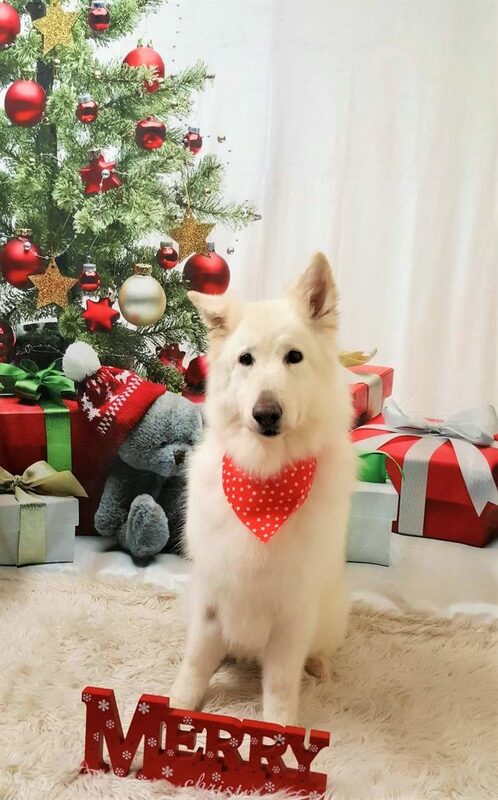 Is everything wrapped and under the tree? Or have you just looked at your calendar and thought blimey, is it only a week away I’d better get cracking? (pun intended!). If you fall into the latter category – I um may actually be in that category – here are some nifty ideas for presents for the writer in your life. Novelty pens/mugs with writing quotes. USB drives for backing up work. Books about writing or inspiring writing quotes. External hard drive for backing up work. A one hour mentoring session with Della Galton. (Special Christmas Voucher can be provided). (£30). A four week course of evening classes in Gillingham Dorset. 7th Jan, 14 Jan, 21 Jan, 28 Jan. 4 x 2 hour sessions. (£34). A one day course on Saturday 12 January in Gillingham Dorset. Write a Short Story in a Day. (£45). Or if you really want to push the boat out, why not buy your writer a week in a writing retreat, or a writing holiday, (some weekend suggestions below) or even his/her very own writing shed. Weekend writing course at Fishguard, Pembrokeshire. 15th to 17th February, 2019. (£249). Click here for more details. For any of my courses please email me HERE for more details. Please state name of course for which you would like details. I asked this question of an author 30 years ago and their first reaction was to say, ‘Don’t do it.’ I ignored this slightly tongue in cheek advice and went ahead! Incidentally, it didn’t take long before I had to get another day job in order to pay my mortgage. You will need to be already established as a paid writer of fiction (or non fiction if that’s your chosen path). Doing both is a good plan I have found. Getting established takes time so it’s important to build up relationships with editors and publishers before you quit your day job. I had been getting paid for my writing for 13 years before I gave up my day job the second time. If possible, don’t give up your day job until your earnings as a writer equal your salary, or come close. Be prepared to live on half your income for a while. If this is impossible, don’t attempt it. Work out exactly what you will need to earn each month. Then work out exactly what you will need to sell each month in order to achieve it. Then write approximately double the amount of pieces that you will need to sell to allow for misses.You are bound to have some. Pick a date and hand in your notice. You can always go back if things don’t work out. This may all sound a little like a tale of caution. So I will add one more thing. Even though I work longer hours than I did while employed, even though it’s very hard at times and I never feel economically secure, writing for a living is still my dream job. I absolutely LOVE it. PS if you want to know if your short stories are publishable, (or even if you just want to make them better) why not come along to my course on Sun 26 August and get some feedback on your story. A character who has a problem/conflict which must be resolved by the end of the piece in an unexpected way. In fact this definition could, very roughly, be applied to all fiction. If one or more of the elements are missing the story won’t quite work. Don’t take my word for it. If you have a story that doesn’t work, try running this checklist against it. Are the following elements in place? If a story isn’t working, I very often find that one of the last two is missing. Another common problem (oh the irony) is that there simply isn’t enough conflict, i.e. the character doesn’t have a big enough problem for the length of the piece. Don’t take my word for it. If you have a story that doesn’t quite work, apply the checklist and see if you can fix the missing element and get the story to work. PS if you would like some more help with identifying what’s gone wrong with a short story I’m running two summer workshops in Bournemouth on Saturday 21 July and Sunday 26 August. You can bring along a story of up to 2000 words for detailed feedback. Email me via this website to book. Motivation – one of my favourite subjects. Motivating yourself to write should be easy, shouldn’t it? After all, we want to write. Don’t we? So why is it so difficult to get started? Recognise any of these excuses – er hem, I mean REASONS? Time: I’d like to write but I never seem to have the time. If that’s you, ask yourself a question. Is it really true? Do you really not have time? Or are you just not prioritising writing? Possibly because you don’t feel you deserve the luxury of having time to write when there are so many other things to do, for example, work, friends and family. Well, if writing is what you really want to do, then don’t you deserve to carve out some time for it? If you were to allocate half an hour three times a week you could probably write a short story in a month (perhaps even two). Little and often really is the key. Focus: I don’t know what I want to write. Why not experiment until you decide what’s for you. Better still why not pick one of the above and set a deadline to complete it. Confidence: I’m not good enough to be published. How do you know until you try? Not many people are good enough to be published until they’ve done some market research and learned what works and what doesn’t. Writing is a little like learning the piano I think – we wouldn’t expect to be concert pianists without a fair bit of practice. Laziness: It just feels too much like hard work a lot of the time. 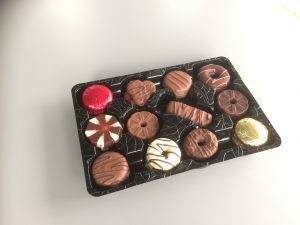 Newsflash – it is! Believe me, I know it is. I write a lot and some days (actually there are quite a lot of them) I would much rather be doing something else. Some days it feels as though I’m wading through sludge. Usually when this happens, I just carry on. (I have to, it’s my day job). Very often it’s because I’ve got to a tricky bit. 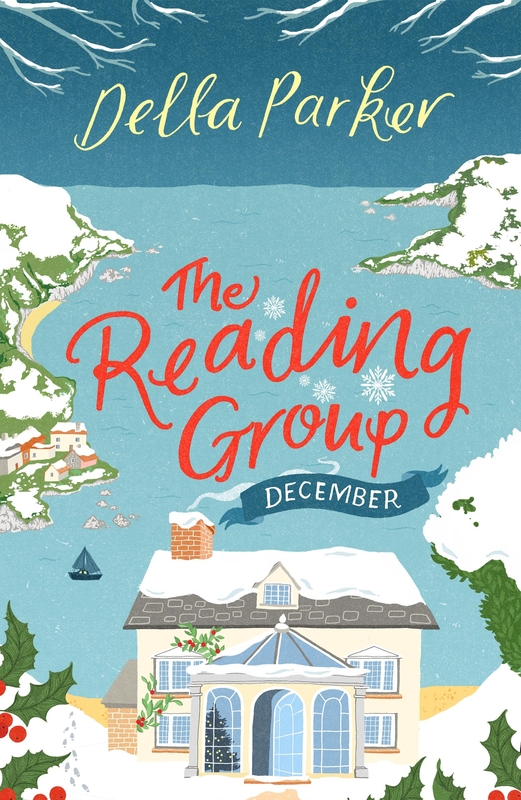 So my top tip for this is that it’s much better to finish writing when I’m really enjoying myself – then I’ll be all the keener to go back to it again. This really does work. Trust me. If you’re really stuck I once heard a novelist say she used to handcuff her ankle to the desk to make herself sit still until she’d done her allotted amount of words. I can’t say I’ve tried this one – but I’m not ruling it out! Firstly, apologies from me! I haven’t written a blog for too long. I’ve been writing a novel and it was all consuming. It’s now winging its way to publishers via my agent, who loved it. So fingers crossed. More on that soon. But here’s a question that came through to Dear Della recently, which might be of interest to you. Q: I have been asked to judge a short story competition, having been a winner more than once in previous years. I am thrilled to be asked, but also nervous. Do you have a set criterion when you judge short story competitions yourself? A: Yes I do. The following is my own personal criterion for judging a short story competiton. Is it a short story and not just an extract or anecdote? Does it begin well – was I hooked? Are the characters believable and convincing? Do I care about the story or do I get to the end and think, ‘so what!’? Is the dialogue realistic and/or convincing? Does the plot work or is it contrived and/or predictable? Is the ending satisfying or does it tail off or feel contrived or predictable? Does the title add to the story? Is the pace right or does it feel rushed or drawn out? Does this story have the X Factor? As you can see most of my points are measurable. They will encompass factors like quality of writing, language and grammar. Number 10 is the one I use when I am trying to decide on a winner. If a story has the X Factor it can sometimes be forgiven other minor faults. It’s difficult to pin down whether a story has the X Factor. They are the ones that send a shiver down my spine – or prompt me to say, ‘Wow.’ I wish I’d written that. They might be clever or funny or poignant. And yes it’s a personal thing – one judge’s X factor may be another judge’s ‘not in a million years.’ But that is what makes a judge unique. Have you ever judged a competition? I’d love to know your top tips. Also on the subject of short stories – my next course is on Saturday 23 June, 2018 in Bournemouth. Write a Short Story in a Day. Last but not least, you can unsubscribe from this email at any time by pressing the unsubscribe button or emailing me and I will unsubscribe you. Many thanks for reading. Just popped on to wish you a very, very happy Christmas. Here is Small Hound, lower picture, dressed in her best festive outfit to wish you the same. 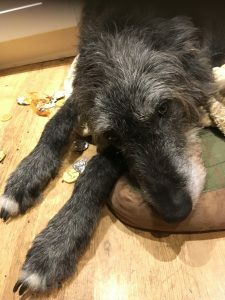 And Big Hound, not wanting to be left out of the festive fun, stole some chocolate coins from the worktop. I am cooking for six this Christmas Day and we have decided to go Vegan. Wish me luck, guys. I hope you are doing something nice. 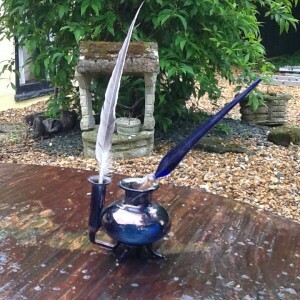 And if you are at a loose end – well it’s a great time for writing. While everyone else is slaving away over a hot stove, you can slave away over a hot keyboard and get in a head start for the New Year. Thank you for reading my blog. And have a lovely festive season, whatever you are doing. With love from Della & hounds! Is it possible to make a full time living writing for magazines? Is it possible to make a full time living writing for magazines? If so, how? I started writing for womags after joining an Adult Education class called Writing for Profit and Pleasure. The teacher was Jean Dynes (she writes as Barbara Dynes – see her column in Writers’ Forum.) In that first class, back in September 1987, Jean asked if there was any news. Wow, I thought. I want to sell a story. Just one would do. (ho ho, little did I know how addictive it was). But how was it done? By researching the markets, I learned, which meant reading the magazine. So off I went to buy a copy of Loving, which I read from cover to cover, several times. They bought the 3rd story I sent. Then the 4th, then the 5th. I was on the verge of giving up the day job when they rejected the 6th, 7th, 8th and 9th. It’s always been like that for me. It still is. And blimey the market is much harder than it was. Back in 1987 there were 100 plus womags that carried fiction. In 2000, which was when I did finally give up the day job to write full time, there were 21 markets. Everyone said it was impossible to write short stories for a living. It wasn’t! But back to my original question. Is it impossible now? When there are a handful of magazines that still take stories from writers (who aren’t on their list). I think sadly that it may be. There are just too many of us out here. I know so many fabulous writers who get their stories rejected because there are only so many slots. So can we still follow the dream of being a full time writer? I’ve been a full time writer for 17 years. Here’s how I do it. I write short stories for the remaining markets. I am the agony aunt for Writers’ Forum. I have several self published books on Amazon which earn me £200 plus a month. I do some journalism. I do the odd spot of teaching. I write novels. Last year I struck lucky. 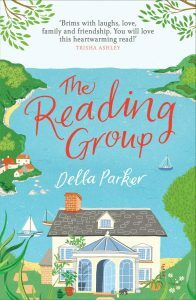 The Reading Group was published by a huge publisher (Quercus is part of the Hachette Group) but I wasn’t paid a huge advance to write it which meant I wrote it in addition to not instead of my usual work. In short, I diversify. My income is made up of lots of bits of writing related work. Lots and lots of bits which means I work lots and lots of hours. Often 60 hours plus a week. I live in hope of having a best selling novel that will mean I don’t have to worry about money so much. The bottom line is that I love writing. I can’t stop. I won’t stop. I think Linda O Byrne’s advice still holds true. Don’t give up. There is always a market for excellence. I don’t think I’ve quite reached excellence yet – but I shall never, ever give up aiming for it. I am lucky enough to be able to teach creative writing at various venues. 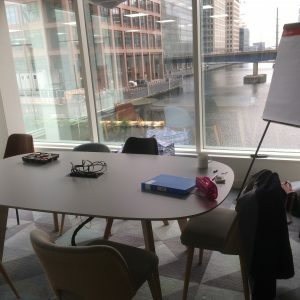 This is Woman’s Weekly’s new home at Canary Wharf. How can you fail to be inspired by this view? Do the course organisers have the credibility factor? Yes, if they are a respected publisher. such as Woman’s Weekly, they certainly do. Choose carefully. Can the course organisers actually buy the work you produce? Yes, in Woman’s Weekly’s case – they buy twenty plus stories a month. They also buy features. Which means that what you learn on the course may actually help you to sell your story to them. Woman’s Weekly have courses in London and in Birmingham. They cost £79 for a full day’s course. Choose from fiction, poetry or journalism. Check here for details. Another wonderful venue, particularly if you are looking for something longer than a day is Writers’ Holiday, Fishguard, Pembrokeshire. 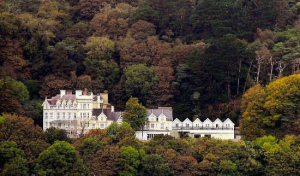 Check out their winter weekend in February 2018 but be quick because it books up fast. £229 fully inclusive. Does your course include all levels of experience? If you’re a beginner you don’t want to feel out of your depth. But equally if you’re a more experienced writer you don’t want to sit through a course that is too basic. Check with the organisers. Both the Writers’ Holiday, at Fishguard and Woman’s Weekly cover all levels of experience, often on the same course. And while we’re on the subject of friendly, I’m pretty friendly myself. Here are the details of my next two Saturday courses in Bournemouth. They run from 10 am till 4.00 pm. A day of inspirational workshops, designed to get your creative juices flowing. Workshop based. Places will be on a first come, first served basis. The first chapter and beyond. Writing the synopsis and cover letter. Please contact me if you’d like to book. I will leave you with some biscuits. These are the ones Woman’s Weekly have on their courses – just saying! I can’t believe how long it is since I’ve blogged. So big apologies. Where has the year gone? I think it’s summer isn’t it, although it doesn’t actually feel like it in deepest Dorset right now! It’s all wind and rain! Anyway, here’s a question that came into my postbag for Dear Della in Writers’ Forum recently so I’ve reproduced it here. It’s an interesting one and I’m sure we’d all have different answers. Q: How much research should you do before you write a novel? How do you know when enough is enough? One of the writers in my local group says she does hers afterwards, but I don’t see how this can work. How can you write a novel if you don’t know the facts that you are writing about? Please advise. A: The amount of research you need to do will vary, depending on your subject and how much you know already. I’d say that more is generally better – definitely don’t skimp because it will show. But if you like research it’s easy to get carried away too. Paradoxical as it may seem, I think that very often you can do your research after you’ve written the novel. How do you know what you need to research until you get to that point? There are pros and cons for both before and after. Here are some pitfalls for doing it in advance. You might do a whole pile of research that later turns out to be unnecessary for your story and hence a waste of time. Or you might be tempted to put in every bit of research whether you need it or not just because you’ve done it. I’m sure we’ve all read novels where this has been the case. And finally, and most dangerously, you might never start the writing because you are having far too much fun researching. On the other hand if you leave it all until after you’ve written the story you run the risk of having to rewrite huge chunks in the light of information you didn’t know previously. So my advice would be to research facts and information before the writing if major plot points hang on it. It probably also depends on how much you plot in advance. If you plot everything out to the nth degree you may well know all the fine points of what you need to research. If you’re more of a panster (as I am) then you won’t. There’s no hard and fast rule. It may just come down to a matter of what works for you. Incidentally the novelist who told me to do the research after the writing was the late Frederick E Smith, author of the 633 Squadron novels. I respected him very much, we had many a long chat at the Riverside Pub, sitting outside in summer overlooking the river and putting the world to rights. So thank you, Fred. Invaluable advice which I still follow. I’d be interested to hear what others do. Happy writing everyone. I’m running a course on How to Write Your First Novel in Bournemouth on Saturday 24 June 2017. 10 till 4.00. Cost £45.00. Do contact me via this website or on Twitter or Facebook if you’re interested. Where is your story set? Settings are incredibly important for fiction. They are where our characters live and they are where we are going to take our readers. So for me, it’s important to choose a setting I know well. 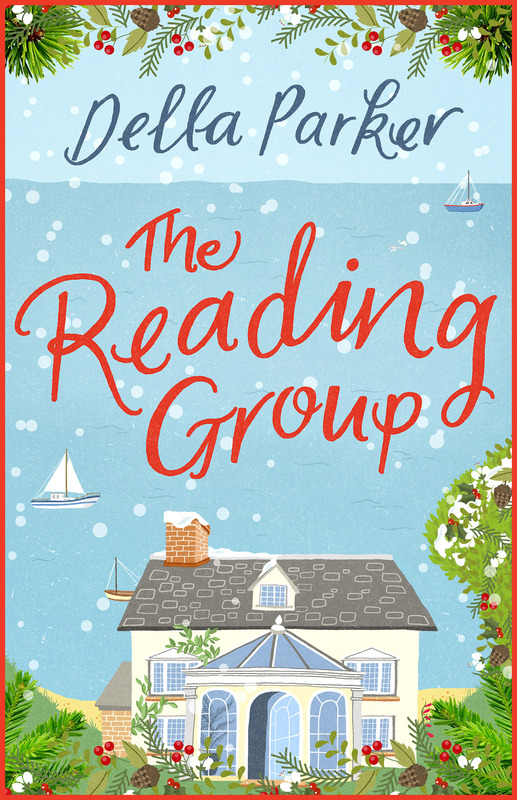 The setting for my latest series of novellas, The Reading Group, was a seaside town in Devon called Little Sanderton. The nearest big town to Little Sanderton is Exeter which is 21 miles away and is mentioned frequently throughout the Reading Group. I should confess here that Little Sanderton doesn’t actually exist but if you were to look up Branscombe, which is in Devon, you’ll have an idea of where I had in mind. When Jojo and Kate go walking to talk about the breakdown of Kate’s marriage in the February, novella they are walking on Branscombe Beach. Serena’s house where the Reading Group meet each month, is set on a clifftop close by. So is Anne Marie’s father’s house. Setting a series of novellas in this area was a delight. It meant I could go back there in my mind. Skip back to this idyllic place and take my readers with me. Not a bad way to earn a living, is it! Click here to buy or get further information.